CREATING THE BEST QUALITY CANVAS PRINTS! Turn your photos into a stunning work of art on canvas with CanvasChamp™. Our custom canvas prints are the best option for decorating your home or office walls! When you need a unique gift for someone, you can help them relive treasured moments in the form of archival-quality images on canvas. We’ll transform your memories into high-end, UV-protected waterproof canvas print. We combine state-of-the-art technology for personalized canvas printing with the best service in the industry. Our gallery-wrapped canvas is available in any size from 5 x 7 inches to 54 x 54 inches! Skilled artisans handcraft wooden frames/stretcher bars from sustainable pine forests. Specially coated poly-cotton canvas provides the highest durability and best color vibrancy. Handmade and hand-laminated photo canvases. Hanging hardware is preinstalled; it's ready to hang out of the box. Printed with UV-protected latex inks on hand-stretched canvas. Well-protected when you select our quality lamination process that puts a glossy finish over the stretched canvas. Most suitable for the photos with centered objects and considerable background spread on the four sides. Centered and wrapped around 1½-inch stretcher bars on all four sides and stapled to the back for a museum-style look without a frame. Available in a range of layouts. You will always remember and treasure the moments of your life that you commemorate with a single custom canvas. It's a credit to CanvasChamp that we have delivered more than 1,500,000 photo canvas prints to our valued customers – including corporations, professional photographers, interior decorators, and designers … and, of course, the public at large. Whether you are creating a wall display, art piece, or one excellent photo canvas, our qualified team is here 24/7 to answer your every minute concern or question. Moreover, your dream of a high-quality canvas print will be delivered through the fastest and safest mode to your doorstep. The best gifts reflect both the giver and the receiver. Offer a bit of yourself with customized canvas art! Create a portrait gallery the grandparents can enjoy every day. Celebrate anniversaries, weddings, or other milestone moments with stunning personalized canvas photos from that momentous day. Capture a stunning sunset or landscape that takes you back to the day you first laid eyes on it. And while a single photo makes a powerful statement, why limit yourself to a single canvas? Split your picture over several canvases to highlight a subject or create movement. Add lyrics or words to your piece to enhance the message in your photograph inspires. Or choose a montage of several related photos to convey a story or highlight a mood. Your imagination is the only limit when creating personalized canvas painting. Use our fun and easy design tool to construct the ideal personalized canvas photo print. Just upload your favorite photo (or photos) and browse through our size and arrangement options. Watch your wall art come together before your eyes. Rest assured that your personalized canvas prints will be of the highest quality materials designed to maximize the beauty and longevity of your art. Using archival-grade canvas, we will transform your memories into high-end, UV-protected waterproof canvas print that are ready to hang straight out of the box. Let us help you turn your photographs into dazzling masterpieces and treasured gifts for years to come. Your Photo on Canvas - At the Lowest Prices on the Web! Custom canvas prints are crafted with the excellence that will gain the attention of every person who passes by. They allow you to relive life’s milestones such as weddings and graduations happily. But they also allow you to showcase the awesome photos you took on vacations and candid precious moments you caught of children and pets. Canvas picture prints add an eye-catching focal point to the empty space on your wall. If you need help coming up with artistic and unique ideas for your photo gifts, please visit our idea gallery for exciting ways to create custom photo gifts. We deliver the most outstanding canvas wrap prints of any photo you choose. We never compromise on quality – whether it’s the ink, frame, canvas, or even a minute, yet essential, part like a hook. Our professional design experts are here to help you fine-tune the details of your image to achieve perfection … free of charge. We also offer most competitive prices in the industry, with free shipping on orders over $69. Just browse our website to find the most suitable canvas photo print custom size, design, and frame to bring your idea to life. You can frame it with your choice of frame. If you have a specific frame in mind, the rolled canvas will be your best option. Have your picture on canvas stretched around a supportive frame and then gallery-wrapped, giving it an exhibit look. If you have an artistic flair and specific ideas about how to mount your photos, you should opt for rolled canvas so you can customize it exactly the way you want. Create unique canvas photo prints online with our amazing photo filters and effects. Digital oil painting gives your digital photos the look of a traditional oil painting. Each one is especially hand-designed by one of our skilled artists using a stylus and a specialized tablet. Use this technique to achieve the look of classic portraits from your digital pictures. Our museum quality will give your favorite photos the look of the masters. Make your photos POP, with the look of Warhol to a range of other eye-popping effects. We provide easy-to-use tools to create a masterpiece of your own. Convert your pictures to cartoon-like images. NOTE: Only faces will be converted; the rest would be changed to a plain background. We follow a very ethical pricing policy. The prices of our products include any add-ons and shipping. There are no extra or hidden costs once you place your order with CanvasChamp. You are only charged the price listed on the website. 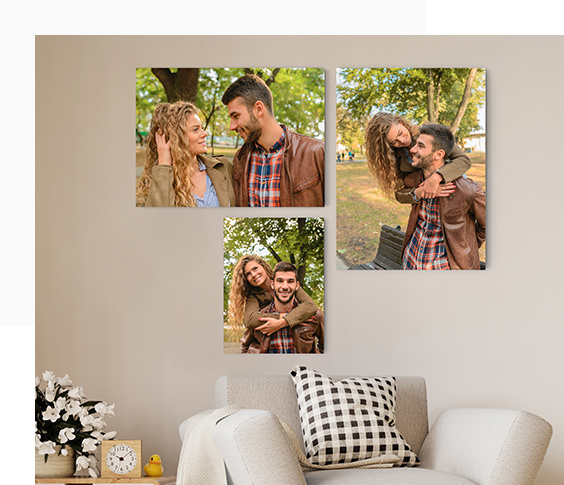 Select the size, upload your photos, select the frames and other options you’d like to add to your personalized your pictures on canvas, and then choose the checkout options. We will send you a preview copy of your image. With your approval, we’ll have your photos printed on canvas at your doorstep in no time. Create the highest quality photo canvas print that’s sure to impress. This can make a great anniversary gift or just a great addition to your home decor. Let words express your feelings through custom canvas enhanced with personalized text. Can't decide which photo you like best from all those awesome shots? Why not display a whole collection! You can create an amazing wall display using multiple photos. Split canvas photo prints are the most suitable option for showcasing memories in a modern and edgy way. Introduce your artsy photos in a new way of hexagon shaped canvas! A precise and exclusive way to present your custom gallery-wrapped prints on canvas. Transform treasured photos into the archival-quality canvas at the lowest prices on the Web! Our customers love us! Rated 4.7 out of 5 based on more than 70844 reviews . Award-winning technology includes certified printers and Latex inks. We offer the best quality canvas anywhere – and we back it up with a 99+ Year Guarantee. Be one of our privilege customers in creating your own custom canvas prints with our easy to use design tool. Lamination and Image retouching options (minor photo retouching and major photo retouching) available which will be taken care of by our expert artisans. Choose from standard 0.75" border wrap or 1.5" border wrap. Custom canvas wrapped sides with image wrap, mirrored wrap, or unlimited colored border wrap option available. We offer the highest quality, gallery-wrap prints at an affordable price. See the canvas sizes chart below of our most popular sizes. 0.75" or 1.5" (depending on the thickness selected) is copied from the edges of the canvas and wrapped around the stretcher frame. This is the option to select if you have important elements near the edges of the image that would end up on the border if you went with a standard image wrap. 0.75" or 1.5" (depending on the thickness selected) from the sides of the image is extended. Over the edges of the stretcher frame. This method will crop some of your images on the front of the canvas. The framed canvas pictures prints are usually made of two kinds of material – synthetic or wood. They are available in different colors, shapes, and sizes – including brown, golden, black curved, beaded mahogany, black flat, bronze ornate … and more! These are all the designer frames and they can be customized according to your requirements. They are fitted with stainless steel or brass hooks and come ready to hang. Sometimes a picture takes on an entirely different look when you modify it with the artistic touch of one of our special effects. You can adorn your canvas print images with versatile colors and a range of effects that include sepia, gray scale, digital oil painting, pop art, and caricatures. This canvas is 0.75 inch thick and is preferable for the smaller-sized canvas prints. This canvas is 1.5 inches thick and is highly recommendable for larger-sized canvas prints. The life expectancy of your artwork will be incredibly longer when it is protected with a chemical layer on the canvas. We can hand-laminate your canvas print to give it museum quality. Not only will it last a lifetime, the glossy finish will make the images more vivid. High protection from the UV rays, sunlight, and other environmental conditions. Deeper effect for black and white pictures on canvas. Quality warranted for 99+ years. Instead of a hook, you have the option of a sawtooth hanger. We will place it on the back of your custom canvas print at the center of the top rail with the serrated teeth of the hanger facing downward. An easel-backed canvas picture print makes it possible to display your photo on a table, shelf, or other horizontal surface. You can easily extend the life of your dream canvas photo print with a sturdy dust cover protecting the back and giving the piece a finished look. An image or photo on canvas, enhanced with touching words, transforms these elements into a unique piece of art. Our team of experienced designers will help you artistically place phrases from your wedding vows on canvas or a quote from a loved one or perhaps an appropriate famous passage on your canvas print to give it heartfelt emotion. Feel free to browse through our sample of custom quotes on canvas for your ideas on adding text to canvas prints. We follow highly secured standards to ensure the safety of your confidential details. Our expert team draws from years of experience in delivering museum-quality canvases. You don’t just decide the way your canvas pictures looks, but also the amount you pay. Our photo canvas prints and services are known to make customers happy. We strive for long-term relationships, so we go to great lengths to ensure the continued satisfaction of our customers through the bond we share with them. To create your priceless canvas picture prints, we use only the best quality certified inks. Get free art consultation on each order by skilled designers. All images will be reviewed and corrected. By our team of professionals before being printed. What Is a Photo Canvas Print ? A personalized canvas print from our best-rated online printing shop starts with a cherished photo or artwork in PNG, JPG or BMP file formats (up to 25 MB). Your image is printed on a specially manufactured canvas using a high-quality polyester/cotton blend. The canvas is printed using state-of-the-art technology using UV-resistant Latex inks. These are the preferred inks for printing because they ensure exact duplication of the photo or artwork and provide vibrancy and longevity. They won’t fade or bleed. How Do You Create a Photo Canvas Print ? It’s easy! You can create a personalized canvas print from photos in a few simple steps. Upload a favorite photo or artwork from your computer, gallery, Facebook, or Instagram. You can create your own picture on canvas in sizes from 5 x 7 inches to 54 x 54 inches. Select a gallery wrap from three options: mirror wrap, image wrap, or a colored border. We offer a variety of options for hanging and display of your prints. Then you can customize your photo on canvas with a choice of color finishes and wide array special effects. Be sure to check out options for lamination and retouching to give your canvas print the best possible quality. Words may not always express how much your loved ones mean to you. So naturally, you’re still looking for gifts that will bring happiness to them. It might be a photo you just took recently, combined with just the right quote to touch the heart of your loved one and create a personalized photo gifts with our online design tool. Sometimes you have so many good shots taken at the same time that you wish you could somehow display them together. With a wall display composed of several individual canvas prints you can narrate that story pictorially … and it will last a lifetime. In our busy lives, we often don’t take time as often as we should to tell the people we care about how much we love and appreciate them. One way to do that is to create customized photo canvases that portray those emotions. We offer a variety of options for creating your family portraits on gallery wrapped canvas with multiple designs, shapes, and color combinations. We give your family photos the flair they deserve and with our museum quality, they will live on as treasured keepsakes. Every photographer – whether he or she is a professional or a person who simply loves taking pictures as a hobby – would like to see his or her shots showcased on high-end quality photo canvas. We are well-known for premium materials. We use in producing our decorative prints – be it acrylic, glass, metal and more. We also offer professional design assistance and prompt service. We stand behind our products with a "Love It" guarantee. Visit us to create your dream at the most economical rates and the highest quality. Wedding picture canvas with song lyrics allows you to relive the beautiful moments of life. Your wedding ceremony must have kept professional photographers busy clicking shots of your special day. Now let it be immortalized with a unique treatment on custom size canvas picture prints. A photo collage also displays several photos, but unlike a wall display, they are all printed on one canvas. You could be whimsical and show a mix of unrelated photos, or you could arrange photos from different times that may still share a theme. 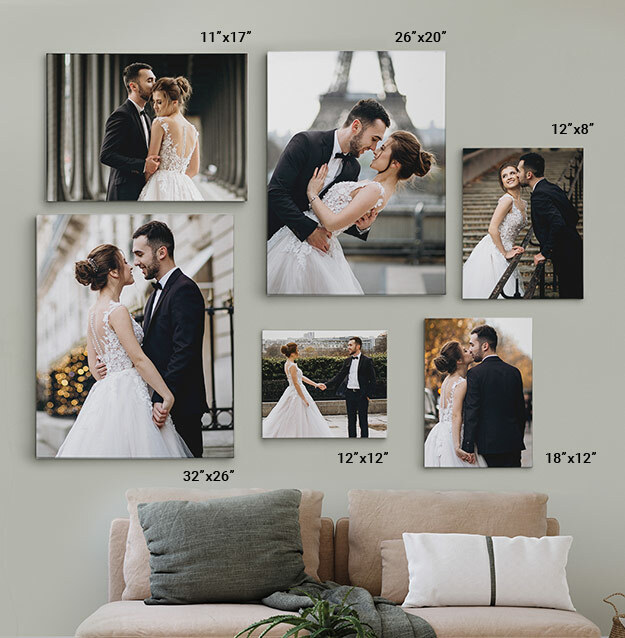 Our floating frame is designed to give a premium-quality framing option for your unique canvas print! A sleek black frame, made with an elegant wood finish, gives a floating effect to your canvas. The floating framed canvas 0.75 inches deep. It transforms your image into a stylish eye-catcher with gallery quality. No language describes the love we all have for our pets, and we offer a limitless horizon to explore in expressing that love with our personalized canvas. The pictures of your pets as canvas portraits will leave every person who sees them speechless at their stunning presence. Want to turn your photos into a canvas print?